Rogue Theater will celebrate its sixth Christmas with a holiday production by Trisha Dean. 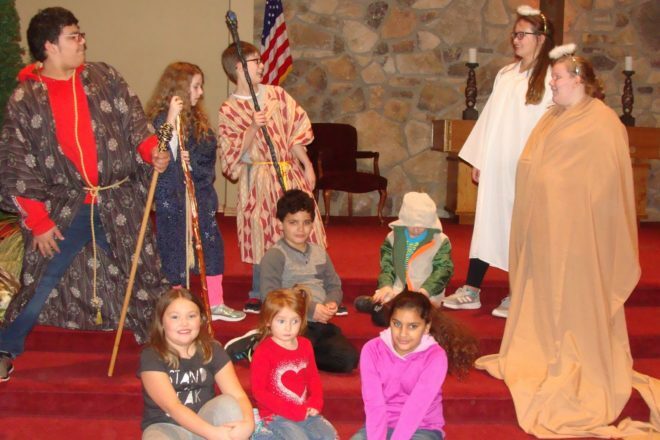 Let’s Tell the Story is a mix of old and new, as storytellers tell the Nativity story in a fun and humorous way. It begins when a group of kids sing a song together and begin to talk about what Christmas is really about. The script offers a host of well-known Christmas carols and a chance for the audience to sing along. Filled with songs, holiday cheer and a special message, this production is sure to please the entire family. It is performed by a cast of 23 children, teens and adults from throughout Door County and directed by Lola DeVillers. As families gather for these holiday production, Rogue Theater is donating food items for local families in need. Audience members are encouraged to take dry or canned food items to the theater to help double the donation. All food collected will be donated to Lakeshore CAP of Door County. Let’s Tell the Story will be performed Dec. 14 at 7 pm, and Dec. 15 at 2 pm. All performances will be held at the Prince of Peace Lutheran Church, 1756 Michigan Street, Sturgeon Bay. Admission is free, but donations are appreciated. For more information, call 920.818.0816.